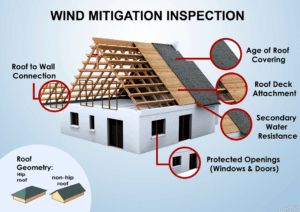 A Wind Mitigation Inspection is a specific inspection program initiated by the Government to help homeowners of houses located in a HVHZ Zone, (High Velocity Hurricane Zone) lower the cost of their home owners insurance. Until recently, these inspections were required mostly in areas in South Florida, but recently insurance companies in the Central Florida area have been requesting Wind Damage Inspections for homes here as well. A Windstorm Inspection may reduce your Insurance premiums. Wind insurance discounts are available for building features that reduce damage during high wind events. The wind mitigation discounts are justified because stronger, more wind resistant structures have lower windstorm losses, which mean reduced costs to Insurance companies. Most existing structures have one or more wind resistive construction features and may qualify for some wind mitigation insurance discounts. 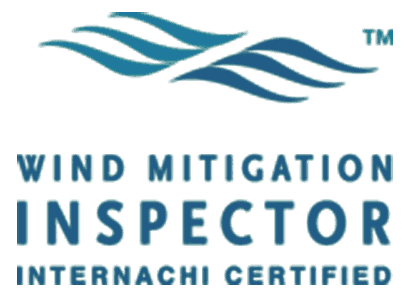 Insurance companies in Florida are required to recognize submitted wind inspections performed by qualified personnel and will provide discounts based on the construction and/or mitigation features of your home. A wind mitigation inspection may “SAVE” you, the property owner up to 75% on your insurance policy, possibly saving you over $1000 annually. There are currently 9 qualifying discounts and we will inspect all 9 areas to help you get the best discount available. * Determination of the roof geometry a) Hip Roof, b) Non-Hip Roof, or c) Flat Roof (a Hip Roof with less than 10% of any other roof shape and less than 100 sq ft of flat area will benefit). 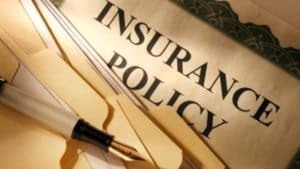 * On a gable roof, the inspection of any gable end bracing that meets the 2001 FL building code or stronger will benefit (currently this credit is not being given by many insurance companies). * The inspection and verification of any Secondary Water Resistance applied to protect the dwelling from water intrusion (currently only a self-adhering polymer modified bitumen “peel and stick” or a foam adhesive barrier applied to every seam on the roof deck and applied to each side of every rafter or truss will benefit). 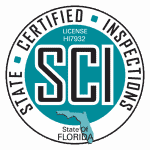 * Verification and inspection of wind borne debris protection on every exterior opening – including the windows, doors, garage doors, & skylights (Impact Resistant coverings that meet the FL Building Code or Miami-Dade approval will benefit the most. Non Miami-Dade or Non FL Building Code shutters along with plywood or OSB coverings depending on how strong and how it is installed may receive a discount). 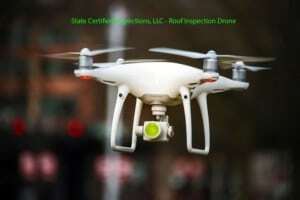 * In the end, investing in a wind mitigation inspection is at your own discretion. The potential cost-savings per year could easily outweigh the cost.